Airtel Payments Bank is India’s first payment bank. 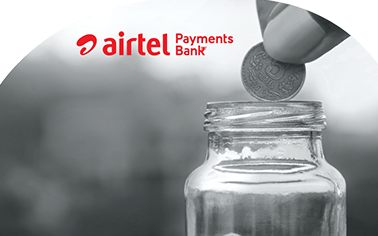 Airtel payment bank is offering maximum interest 7.25% on the bank account. You must be wondering that what is payments bank and how it is different compared to other normal bank accounts? In this post, I will be sharing information about payment banks account, Airtel Payments bank account opening process and other information. A payments bank is small scale bank. The prime objective of this bank is to enhance the reach of banking services, especially in the rural area. Payments bank operates through mobile phone as compared to a traditional bank branch. These banks can accept a restricted deposit, which is currently limited to 1 Lakh per customer. Under this bank, your mobile number will become your savings account number and there will be no pass book and cheque book. Airtel Payments bank is one such bank. It is fully digital paperless bank. Anyone staying anywhere in India can open saving bank account in this bank via his/her mobile phone without visiting any bank branches. This bank operates through mobile application all features of banking are available on mobile application. Key features of Airtel Payments bank are given below. Mobile only bank. 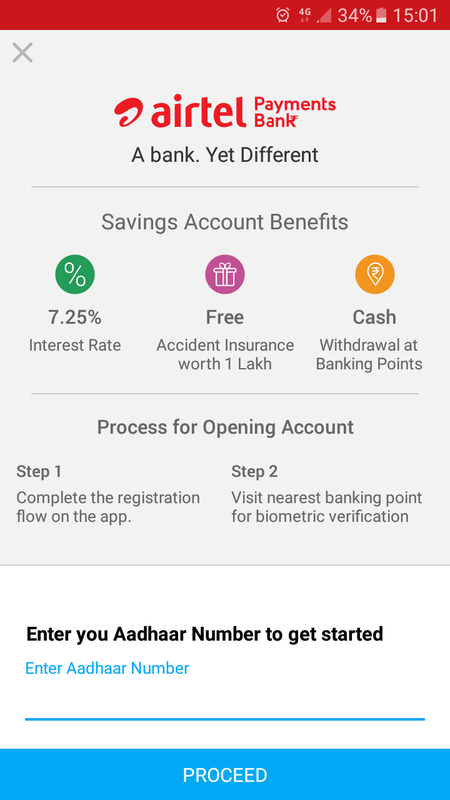 Anyone can open and operate account through mobile app. Highest interest rate 7.25% is offered on money deposited under this account. Free personal Accident Insurance cover of Rs 1 Lakh. Equivalent talk time for every money deposited. Instant account opening with your Aadhaar Card. Real time alert for every transaction on your register mobile number and email. How to open Airtel Payments Bank Account? The process of opening Airtel Payments Bank savings account is very easy. Follow the step by step guide below to open your first Airtel Payments Bank account. You can open Airtel payments bank account by visiting a nearest Airtel retail outlet. Aadhaar card is required in order to open this account. Alternatively, you can download and install My Airtel App from Google Playstore to open the account. On this application click on payments bank and complete one-time registration. Input information required for registration i.e Your name, mobile number, email id. Click on register Now. It will generate OTP and send it on your mobile for verification. Once it is verified you need to give 4-digit PIN and your wallet is activated. Open your wallet and click on “View profile Tab”. In “My profile Tab” click on Apply for Saving account. Enter your Aadhaar Number and click on proceed for opening of account. For biometric verification you need to visit nearest banking point. The benefits of using Airtel Payments bank account are given below. Highest interest rate on saving bank account 7.25%. The bank accounts in this bank can be opened by airtel or non airtel users. No additional transaction charges up to Rs.10000 per day. Access to online card that can be used to make payment across. Personal accident insurance cover for every account holder. What are the drawbacks of Airtel payments bank? For withdrawal of fund up to Rs.4000 fees is applicable up to Rs.25. You need to pay 0.65% of withdrawal amount if you want to withdraw cash above Rs.4000. Account closing charges is Rs.50. Transfer charges are applicable for money transfer to other bank account. The interest rate offered by this bank may attract you. However, please note that the concept of payments bank is very new in India. People are still not ready to accept this concept. There are many questions and doubts in people’s mind. Hope popularity of payments bank will grow in days to come.